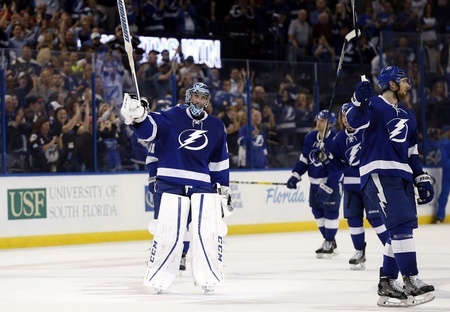 The Tampa Bay Lightning have eliminated the Detroit Red Wings in Game Five of their best of seven series. They are the first team to advance in this year’s post-season. The victory came after a tight game on Thursday night, with the Lightning scooping the 1-0 goal with under two minutes to go. Alex Killorn tagged the winner by batting the puck out of the air. The series was closer than the statistics suggest, but the writing was on the wall when the Red Wings entered Game Five down three games to one. Teams facing such a deficit win less the series less than 10 percent of the time. And Detroit had to counter one Ben Bishop, too, which was a problem in and of itself. Not only did the 29-year-old netminder close the door with a shutout on 33 shots in Game Five, he allowed just eight goals in the series. Only three of those goals came on “clean shots” on target, which suggests he’s stopping almost everything he sees. As we touched on our the Breaking It Down piece, Tampa stuck to a clear system and let Bishop see the puck. And they turned out quality scoring when it counted, with Nikita Kucherov leading all playoff scorers with five goals and a total of eight points. Linemate Tyler Johnson has five assists, while Killorn has five points including the series-winner. Tampa was also able to get their forecheck going, which led to critical turnovers from the Red Wings. The Lightning capitalized on their opportunities more often than not, even with injuries to Steven Stamkos and Anton Stralman. Goalies Jimmy Howard and Petr Mrazek split time for Detroit, but they weren’t able to find the right rhythm. Mrazek started the last three games of the series after Howard dropped the first two decisions and skated off with a dismal 3.59 goals against average and a .891 save percentage. The 24-year-old Mrazek was a slight improvement, but in the end the duo couldn’t get it done. The better team won this series and the Lightning will move on to face the winner of the Florida Panthers/New York Islanders series. Tampa will eventually have to address the problem of secondary scoring, but they’ve got the series win and they should have some time to rest before they roll again. That could give some much-needed juice to the likes of Valtteri Filppula and Jonathan Drouin, the latter of whom was able to generate some serious energy on the power play in Game Four. As for the Red Wings, they’ll move on to make some critical decisions. Pavel Datsyuk may be heading to Russia to finish out his career and he went without a point in what could’ve been his final playoff series in the NHL. He registered 15 shots on goal. 35-year-old Henrik Zetterberg had a goal and 10 shots on target. He nudged at nearly 20 minutes of ice time per game and could be responsible for taking over this team next season. He’ll need help, to say the least. The Red Wings have now been eliminated in the first round for the third year in a row and the fourth time in the last five years.